It’s possible but need to customize it for your need. hello i buy this plug in,plz confirm whether it compatible with all classipress childthemes and your store+deal press themes. Yes it’s compatible with all child themes included my dealpress and storepress. Hello, I installed the plugin, and enabled the display of the icons. However when I go to Ad categories and press add icon, all I see is the standard text (Add media file from computer, from url…). Can you please guide me on what to do next in order to enable those Icons? You need to enable Home Page Layout with directory style. Please go to wp-admin -> ClassiPress -> Settings -> General Home Page Layout select Directory Style. You need to upload icons for specific category go to wp-admin -> Ads -> Ads Categories (Add/Edit) Category for add/remove icon. When you upload a new image be sure that the “LINK URL” is visible. If there is no text (like the attached image) simply click on the “FILE URL” button. A text url will appear in the box and after clicking on “Insert into post” the image should be visible ! thank you for your reply, as a matter of fact, I thought that the icons come with the plugin. HI is this plugin compatible with classipress childtheme “adsplash” ? I didn’t check it with “adsplash” childtheme. Bought this plugin. why i install plugin fail? tried as per your installation guide. Didn’t work. Tried downloading category-icons.zip. but failed. Tried unzipped files also failed. It’s working will with 3.5.1 and WP 4.3.4. Yes you can translate it in your language. 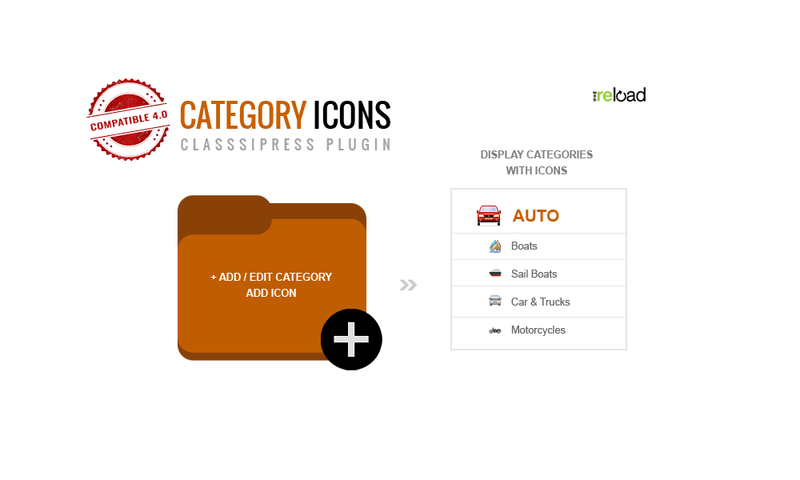 I have purchased your icons plugin for my classipress wp theme. But after successful installation of the plugin, when I upload the icon for categories > then after clicking on “insert into post” button the “white blank dialogue box” is shown and the icon doesn’t seen. And when I close the that “white blank dialogue box” the icon can’t be seen there. hello reloadweb i have the same trouble with Khalid Ahmad, I have purchased your icons plugin for my clipper themes.I successful installed the plugin, when I upload the icon for categories > then after clicking on “ uptade” button the icone i download disappaer and don’t show anything, the icon can’t be seen there in the categeorie page even my site . need your help what i have to do ? this plugins works kin clipper theme? was successful download and appear in my work panel. thank you to reply to me. I replied you on Facebook this plugin will work only with ClassiPress theme. I just bought your plugin. That’s cool. But I don’t find the “Home Page Layout” into Classipress /Settings… Is there another way to display Ads Category icons layout to my homepage? How many icons does this plugin have? Hello, I just bought the plugin, I followed the instructions, but impossible to add icons in a category, when I add a 32×32 image in the field after clicking on the update the image disappears of the icon field. Hi, I want to buy your category icons plugin, but first I want to know if it is compatible and works well with calssipress 4. Hello, good afternoon, I’m waiting for your answer to know if your module is compatible with classipress version 4, and according to your answer I bought your categoy-icons module but I can not upload the icons yet. can you help me or tell me what happens?